I recently had the pleasure of attending a presentation given by Dr. Raj Lalloo at the Council for Scientific and Industrial Research (CSIR). Dr. Lalloo introduced the wonderful world of bacteria to us. Over the years bacteria has unfortunately got a bad rap as being dangerous and disease spreading. However, Dr. Lalloo explains that this is far from the truth, and that there are so many varieties of bacteria, some of which are pretty darn amazing and not at all harmful (see our post That Gut Feeling)! The CSIR has a library of categorised bacterial strains that they have been using to find solutions to some of the country’s waste water problems. It all started a few years ago when private companies began approaching the CSIR to request assistance in trying to treat and clean the waste water they were producing. The CSIR began to try and assist them. First they analysed the waste water that was being produced and then, through laboratory testing, they developed a cocktail of natural and indigenous bacteria that was able to clean the waste water by digesting the nasties and leaving only the good stuff (clean water) remaining. This project became so successful that the CSIR commissioned Dr. Lalloo to create a standalone company under which the project could continue, and so, OptimusBio was born. 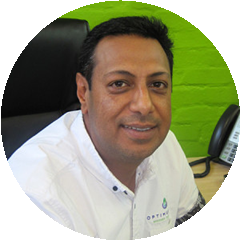 OptimusBio continued their research with the CSIR, assisting clients with custom designed solutions to their waste water problems. 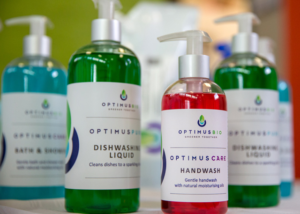 Apart from the industrial waste water treatment products, OptimusBio have also launched their own range of home, household and vehicle cleaning products, to bring this technology into your home. We were luckily enough to catch up with Dr. Lalloo and ask him a few questions about how OptimusBio works, how the bacteria are identified and used and what products OptimusBio offer. G@H: Hi Dr. Lalloo, thank you so much for taking the time to chat to us. Can we start off by asking what you studied to become so knowledgeable about bacteria and how you landed up working at the CSIR? Dr Lalloo: I was pretty bright at Science, but quickly got bored with academics. After completing a BSc in Microbiology and Zoology and then an Honours in Biotechnology, I spent a few years at the Goldfields Biotechnology Centre at Rhodes University, working on industry related projects. When AECI started to build the largest fermentation plant in Africa, I had to be a part of it. Science in action at green overall level, producing real products and solutions. Since then, the use of bacteria to solve real world problems has been my goal and miraculously I was able to complete my PhD in Bioprocess Engineering at Stellenbosch University through that journey. I still spend part of my time at the CSIR as Chief Scientist, guiding the new generation of young professionals to make tangible impacts on society. Bacteria are natures machines and are a true reflection of “Science at Work”. G@H: Bacteria is quite a board term. We read about it on our yoghurt tubs, we hear about it on the news and we get lectured about it by our doctors. But what exactly is bacteria, where does it come from and why are some bacteria bad and others good? Dr Lalloo: The majority of bacteria are a part of natural processes such as, breaking down wastes and cycling nutrients. We refer to this state, as a balance of the natural order. It can be argued that the natural balance is actually altered by human intervention, hence causing disease and environmental problems. As an example, the excessive use of antibiotics has itself led to horrible superbugs, resistant to antibiotics. Similar evidence is now also being found for antibacterial soaps and disinfectants. Bacteria are everywhere in nature and on our bodies going about their work, but the propaganda that they are all bad, has led us down the wrong path. Luckily professionals and consumers alike, are now starting to take a new view on alternate choices. G@H: How many bacterial strains does the CSIR have access to, is it hundreds, thousands or millions? Dr Lalloo: CSIR’s organism database has hundreds of different pure isolates. These are obtained from indigenous natural environments and proven to be absolutely safe, before being uses in any product. They have some neat technologies to select the best microbes for a particular application and then we can produce them in quality processes and formulate them into products that consumers are familiar with (i.e. soaps). 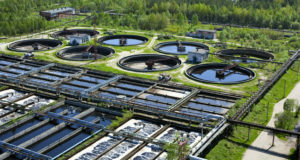 G@H: What kinds of waste water (industries) have OptimusBio had to find treatment solutions for and what does that process entail? Dr Lalloo: The list is constantly growing as we demonstrate new applications ranging from conventional sewage type effluents to food industries such as dairy and poultry, to heavy industry such as mining. Regrettably, industries have been the major polluters of the environment, but it is refreshing to see an increased focus on environmentally sustainable business practices. Providing a solution generally involves a site evaluation so that the existing treatment process and challenges can be identified. Samples of the waste effluents are also taken for laboratory evaluation. We then match a collection of the correct microbes to deal with that waste, if we do not have an existing product. We do a full treatment simulation in a small-scale system in our labs and thereafter work with the client to do an on-site pilot demonstration. Industry specific retrofits to the prototypes are then done to ensure user acceptance and ease of use. G@H: How long does it take to develop a treatment solution or does it depend on how contaminated the waste water is? Dr Lalloo: This really depends on the novelty of the type of contamination. For conventional treatment, a solution can be available off the shelf or in a matter of weeks after some bench scale testing. In cases where the waste stream is complex, it could require a few years of research and development by the experts at CSIR. Both the CSIR and OptimusBio work in agile mode, which means test prototypes are deployed in real world situations with industry partners through the project. G@H: We see on your website that one of your partners is Earth Probiotic, one of the companies that make Bokashi bran. We love Bokashi’s! How are bacteria and Bokashi bran related and in what way do you partner with them? Dr Lalloo: We loved the principle of biologically treating food waste into plant food. As scientists, we were not so fond of the mixed uncharacterised fermentation process used to produce traditional Bokashi. We used the best technology available at the CSIR to select the proper bacteria for Earth Probiotic, such that they could have a highly functional, safe and characterised product, meeting regulations for export. The partnership is amazing as they now have a unique product, backed by expertise in organic solid waste handling up to industrial scale. This is making a significant impact to how solid organic waste is being handled at household and commercial level. G@H: We see that the OptimusBio Ethos is “Greener Together”. What does that mean for you and why are you so passionate about environmental sustainability? Dr Lalloo: We are only a small part of the solution, providing the enabling technologies and the products. To positively impact better well-being and environmental sustainability, requires so much more. We need the togetherness of media, public sector, private sector, households, educators, regulators, etc. to champion this agenda. Our “greener together” ethos is based on a call to action with the main enabler being home grown technology by the people for the people. My passion for alternate ways of living stems from my wife’s ordeal with an inflammatory disease called SLE. As a brain aneurysm survivor and therapy free functional mother of two, she bears testament to the possibilities of the simple choices we can make. I think environmental well-being and people well-being are inextricably linked. One cannot work without the other. G@H: What advice would you give our readers in terms of making their lives a little greener, conserving water and caring more for the environment? Dr Lalloo: It all starts with a conscious choice to do things differently, to live life differently. Not all at once, but through tiny increments and fractals; a lifelong journey of evolution towards a better future for the generations to come. A different choice at the supermarket, be it food or detergent. When we harmonise with nature, it all seems natural and somehow simpler. G@H: Can you tell us a little more about your earth-friendly biological home, household and vehicle cleaning products? Dr Lalloo: Each product has unique attributes to satisfy a wide range of design criteria, using the latest technology. For the user, they are simply safer, gentler, smarter. Using active microbes starts the waste treatment process at source, so with very use, you can be sure that you are doing your tiny bit towards a better tomorrow. You will find that the cleaning products foam less, but clean just as well as conventional cleaners. They are completely compatible with grey water, septic tank and other treatment systems thus creating new opportunities for saving water. Like our team at OptimusBio, our products are authentic. They are biodegradable, biologically active, fully locally manufactured and hence conform to our “greener together” agenda. Thank you so much Dr Lalloo for this insightful information and for opening our eyes to the usefulness of bacteria! It’s amazing that the earth has provided us with a natural way to clean up our mess and to help protect our environment going forward! It’s so important for us to be caring about the environment at home and at work, so if you work in industry and your company is looking for an environmentally friendly water or waste treatment solution why not contact OptimusBio and see what they can do for you. OptimusBio is carrying green sustainable cleaning and treatment solutions beyond the household and into the work space! We can’t wait to see what else OptimusBio will be able to achieve! For more information go to http://www.optimusbio.co.za/. I'm passionate about sustainable water management in South Africa. I believe that through effective collaboration between private and public sectors we can ensure that all South Africans, not just the wealthy, have access to clean drinkable water and formal sanitation.